WebAIM recently published it’s sixth screen reader user survey. As ever, it makes interesting reading, not least with respect to the significant increase in the numbers of ZoomText users this time round. What is disappointing, however, is the survey’s finding that PDF accessibility hasn’t improved significantly in the last six and a half years. 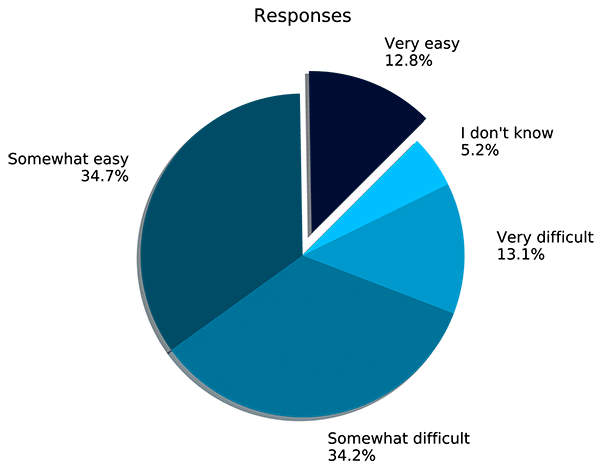 The survey reported respondents’ degrees of difficulty with reading PDF files, as follows. Figure 1: pie chart showing percentages of respondents reporting various degrees of difficulty with reading PDF files. there has not been a significant change in perception – either for better or worse – of PDF ease or difficulty in the last 6.5 years. This is a problem that needs an explanation. It’s certainly not a technical problem: the technology to build and to use highly accessible PDFs has been in place for many years. The know-how has also been available for a long time (I have been teaching it since 2007). One explanation is that whilst almost every web manager or editor these days knows that online content has to be accessible, not that many are aware of how straightforward PDF accessibility can be. For this reason the work never gets started. But even a complete beginner can learn in a morning how to make accessible PDFs from Microsoft Word/Libre Office/ Open Office, and it takes just a day to do the same for more complex documents using InDesign. Another problem is that all too many accessibility-aware web managers have their hands tied by non-web-savvy senior management. I have a great deal of personal experience in this area, and so appreciate just how difficult and frustrating it can be. Nevertheless, this is where much of the battle needs to be fought and won. We also need to keep raising awareness that PDF accessibility is not some giant problem without a solution.